Its not too late to get your tickets for the Sandhurst Joggers Annual Ball which will take place at Easthampstead Conference Park, Off Peacock Lane, Wokingham, RG40 3DF on Friday 29th March 2019 at 7.30pm. The cost of the tickets will be £35.00 per person. SJ Social Secretary Lisa Harrold has sent all the details by email. Please respond to secure your tickets asap. The Sandhurst Joggers AGM will take place on Tuesday 5th March at 8pm. The venue is Edgbarrow Sports Centre, Grant Road, Crowthorne, RG45 7JL. Allmembers are welcome and encouraged to attend, it’s YOUR club and it’s YOUR wishes and opinions that drive how it’s run. At the AGM, we elect the entire committee for the coming year. It’s always good to have new faces on the committee. Descriptions of the positions will follow by email and are on the website, but for the moment, just have a think about whether you’d like to stand, or encourage those you think should! We already know that the Secretary, Social, XC Captain and Thursday GM positions and one of the Events roles will be vacant. Wednesday evening saw another good turnout at Handicap. We’ve got a full report HERE. A reminder to all participants to wear High Viz clothing and a head torch, be careful crossing roads and especially careful on Crowthorne High Street. Also, non members are welcome to run (although wont be counted in the results) but Under 16s are not. Richard Boese snuck a marathon in before the end of the week as he completed the Saxons, Vikings and Normans Martello Marathon on a 3 ‘lap’ coastline course which was flat, fast and traffic free along the Saxon Shore Way. The run was partly on the promenade, the coastal path and the sea defence walls heading towards several Martello Towers between Folkestone and Hythe and included running past Sandgate Castle. In total the total run included less than 50 feet of elevation so will be good preparation for the self-claimed Flattest Marathon in the world; the Boston (UK) Marathon in April. Richard finished in 5:02:46. Bracknell parkrun was the pick for 21 members and the recent dry weather led to faster conditions than of late. Maybe it was the guest appearance by famous parkrun tourist Wonky Bear Junior!?! Big congratulations to James Ratcliffe who led members home in 10th position. He also led a SJ clean sweep of the VM50-54 top 3 ahead of Martin Steadman and Carl Bradshaw. Sarah Hyatt added to a successful week with 1st in her category. In their respective categories; Lottie St Aubyn took 2nd, Krzysztof Zielenski 3rd and he also celebrated his 50th parkrun, Matt Jones 3rd and Jane Bannister 3rd. Over at Frimley Lodge parkrun Alistair Ingall-Tombs continued his streak of bests grabbing a new course record for the venue in 20:02 as well as second in his category. Clive Rolfe was the first SJ finisher as he recorded his fastest time since 2017. We also had Graham Kelly take 2nd in category with his fastest time since 2016, Mo Willcox with another 2nd, Janet Venables and Alison Bone took 2nd and 3rd in their category while Mark Pattrick and Simon Whillis book took 3rd in their respective age groups. A select team of five SJs lined up at Rushmoor parkrun where Graham Bolton was the first of them to finish. It was one of the most diverse weekend of parkrun tourism we’ve seen. Starting with the local events. Stuart Overhill continued his streak at Bedfort Lakes and finished 12th, George Green returned to Reading for the first time since 2012, Martin Gould tried Guildford for the first time while Alurie Dutton and Yvette Glacken were collecting their U at Upton Court. Further afield Rob Jerrett took 7th at Andover, Grizzly lover Paul Alexander paid homage at Seaton, Beanie Watson was at Tooting Common, Dave Bartlett tamed the hills at Cuerden Valley in Lancashire plus Frances and Andrew Parkes ran at Coventry. A trio of SJs made the pilgrimage to Bushy Park so congratulations to first timers Jane Ralls and Lyn Winter who both posted outright PBs and Jane Pond who bagged herself a Course Record on her second visit. 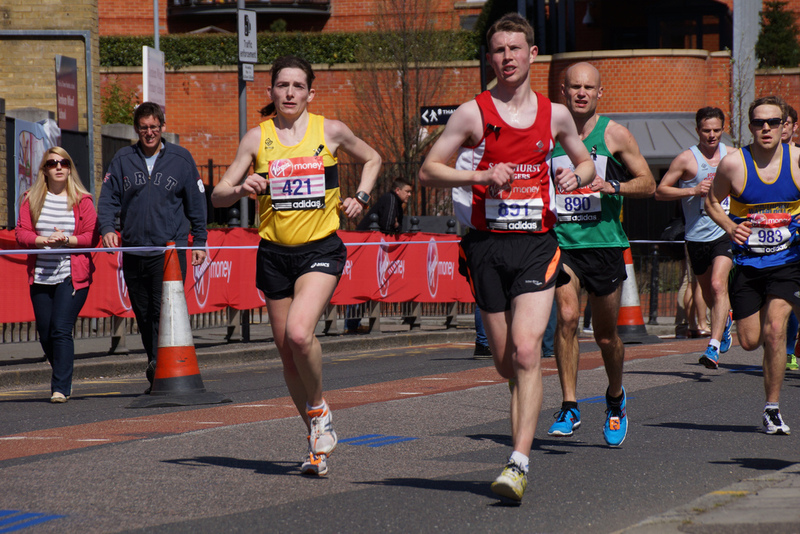 The Kelly’s Guildford 10k was held on a course starting and finishing at the University of Surrey campus. Monica Burbidge and Lisa Hale both ran well and enjoyed the course despite the significant number of steps! The final event of the G3 Fitstuff series was held on a typically hilly course near Newlands Corner in the Surrey Hills. Harvey Young completed the tough 10k course in 1:18:38. Patrick Wadsworth finished 4th in his category in the 15km event finishing in 1:31:19. Sarah Jones had a great run at round 2 of the Windsor Winter Fun Run and Duathlon series. She finished the 5k event in 39:50. Alison Jones finished the 10k in 49:48 as she finished 3rd in her category. Under blue skies at the Hampton Court Half marathon Phil Guy recorded his second fastest half marathon with a 1:27 finish. Traditional early spring distance training race the Bramley 20/10 was held in great conditions this year. Just one SJ entrant in the 10 mile event with Charlie St Aubyn proving that a house full of teenagers night before a race won’t have a negative effect on your run performance. A few more members took on the 20 miler. Both Jim Laidlaw and Paul Biggs improved on their times from last year while Sharon Burfield and Blanche Barnes had successful debuts at the Reading Roadrunners event. Thursday: This week the threshold/improvers run will be on the Crawley Ridge route. Meet at Sandhurst Sports Centre at 7:30pm and don’t forget lights and high vis clothing. The run is a great way to improve fitness by running as a group at a slightly harder intensity. There is a shorter route available and a sweeper so nobody gets left behind.